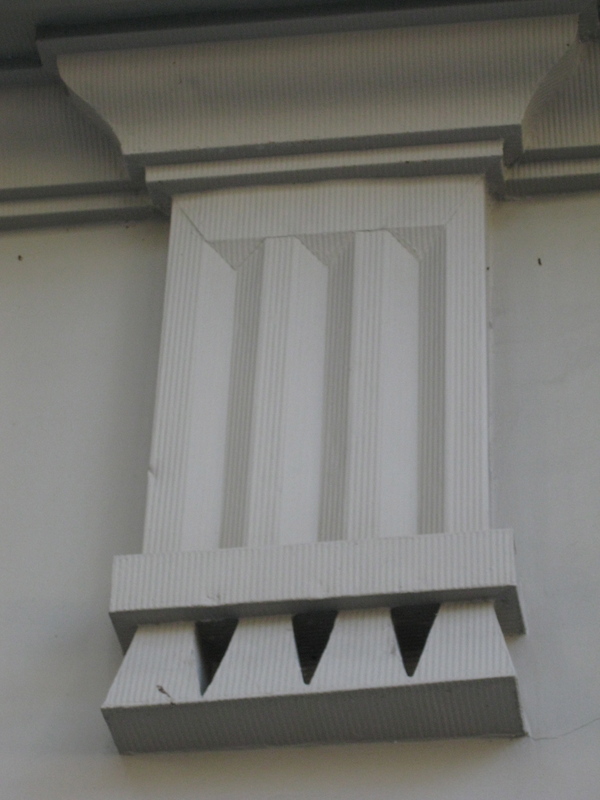 The triglyph is a common architectural detail on historic Charleston buildings fashioned in classical styles. 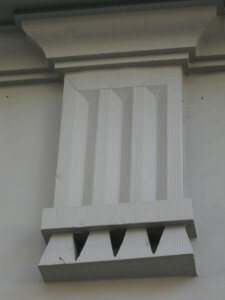 This curious but distinctive-looking form, usually made from plaster or wood, is typically found on the section between a column and roof or floor, known as the frieze. It looks roughly like the Roman numeral three, and has small, dot-like elaborations at its base, which are called guttae. The triglyph comes from ancient Greek and Roman architecture, and can be seen on structures that date back thousands of years. Although its origin is not completely certain, it is generally believed to be a symbol of order in architecture that was the essence of the Greek and Roman styles. The legs of the triglyph are supposed to represent the end section of wooden beams, cut in funnels to shadow their rough edges, and the guttae represent pegs that joined them. This is derived from the Roman architectural historian Vitruvius, whose Ten Books on Architecure were written about 15 BC. Vitruvius believed that there was a higher purpose in architecture than just putting up a roof and walls, and that all buildings should possess three qualities – strength, utility and beauty. Perhaps that is what the three columns of the triglyph truly represent.